One of the main goals of the current debugger from Pharo is to be easily extensible with new debugging actions and new user interfaces. Towards that goal it models all debugging actions as objects that can be dynamically added to various widgets from the user interface. A high-level view of the debugger is given below. The session is the base component of the debugger. Its role is to implement the low-level operations needed for working with processes and execution contexts. For simple actions one does not need to extend it. 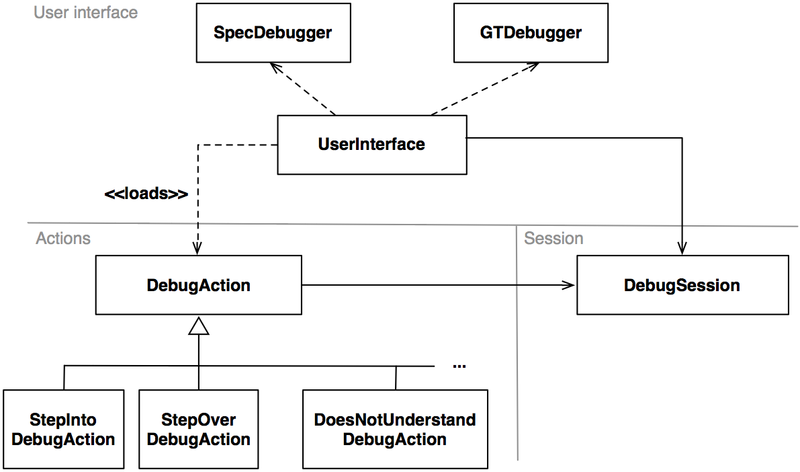 Each debugging action is encapsulated in a subclass of DebugAction. Debugging actions are then loaded by the user interface. Currently there are two different user interfaces for the debugger one written in Spec and the other in Glamour. Next we will go through the process of creating, step by step, one debugging action. As a running example we will implement an action for reacting to doesNotUnderstand exceptions. This exception is raised when an object is asked to execute a method that is not implemented by its class or any superclass. Given that Pharo uses dynamic typing, this error is *caught* at run time and a debugger is opened. The debugger allows us to create the missing method. We can implement this feature using a debugging action. To customize the action we need to override several methods. The first one is #id and it should return a symbol uniquely identifying the debugging action. To change the label of the action we need to override #defaultLabel and to control the position of this action among the other debugging actions #defaultOrder. An important aspect of this action is that it should only be active when the debugger is opened as a result of a doesNotUnderstand exception. To achieve this we need to override #appliesToDebugger:. This method allows us to control when an action is active. Last but not least we need to implement the actual logic for creating the missing method. This is achieved by overriding executeAction. In this case the logic is a bit complicated but you do not need to understand it in details (I also skipped the code for the helper methods). msg := self interruptedContext tempAt: 1.
msgCategory := (self askForCategoryIn: chosenClass default: 'as yet unclassified'). That’s it. 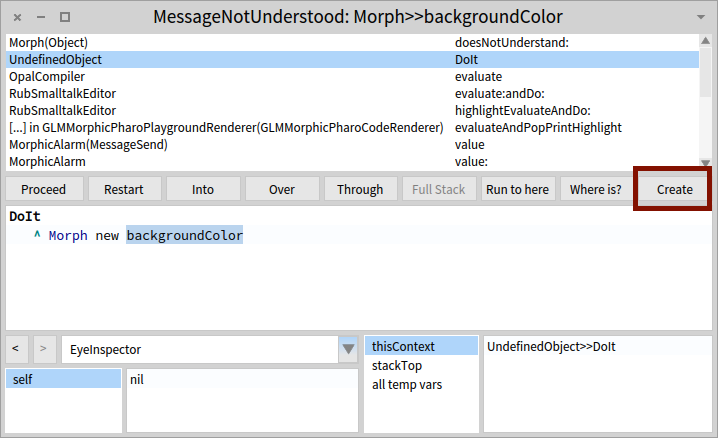 Now if we execute code that is calling a missing method (Morph new backgroundColor) we get the possibility to create that method. More information about what makes this possible can be found at scg.unibe.ch/research/moldabledebugger. Also the debugger is not the only extensible tool from Pharo. There are many more, as part of the Glamorous Toolkit.